A safe heart is one that is never shared. It is also a small, aching, lonely burden to carry. See, hearts (in the figurative sense) were meant to be shared; love grows love and the more you give it, the more you have. You already have it, whether or not someone else shares theirs with you. But what about when you do this giving away of love and believing in the good and the person you gave your precious love to does something awful; they cheat, they lie, they treat you poorly, or (heaven forbid), they die. Your full, loving heart is stabbed, torn, stomped, pummeled into something unrecognizable and hurting more than you ever imagined possible. What do you do then? Retreat. They lock their broken, mangled, suffering heart away. I remember doing this myself at the end of my marriage (divorce of the heart usually happens long before the papers are filed). In fact, I remember sitting in my therapist’s office (I was a hurting mess) and I drew her a picture of how I stay safe. It was a lock box, reinforced, riveted and strong. I kept my wounded heart in there where nobody, and I mean NOBODY, could see it, feel it, hear it, reach it without my express permission. And that permission wasn’t coming, not for a good long while. Loss of love and the death of a forever dream is inexplicably painful. It felt good to feel “safe” for a while. To know that nobody could reach my wounded heart with their mean, cold, selfish hands and hurt me again. I numbed myself to the joy of other couples and while I didn’t begrudge them their happiness, I felt completely cut off from the possibility that I would be able to participate like that again. It was simply too risky. But, Love, like life, finds a way eventually. After a few painfully empty and lonely years of self-protection, I met someone who also had their heart beaten to bits. Difference was, his heart had begun the process of self-revival and it knew a secret. It whispered to my wounded heart through the keyhole of the lock box in a sweet, gentle sound of understanding, patience and compassion. 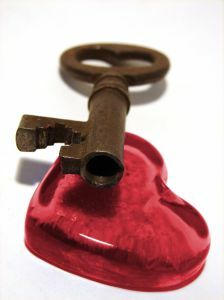 It didn’t ask my heart to come out, but instead spoke quietly through the lock. The connection was made. My heart, against its will, began to recognize itself and refill again. Before long it didn’t fit very well into the tight little lock box that once felt so roomy. It wanted out. My rational mind was afraid. I held the key to the lock box and worried. How could I make myself vulnerable enough to set this growing and wild heart free again? Didn’t it know the risk involved? Did it already forget how much pain it had already suffered? Love doesn’t die. Love is what we are made of, it is at the core of who we are. It is the loss of shared love that is painful, not love itself. Love is grand, fulfilling, purposeful. Holding back and not allowing yourself to fully express and feel love is painful. I got out the key and unlocked the box. Our wounded but quickly healing hearts sailed off together, we could barely keep up! Being willing to share your love with another person gives you courage. It takes personal strength to allow yourself to be vulnerable, but the reward of connecting love with another heart is powerful, enriching, life changing. Did our hearts live happily ever after? Yes, they did – but not together, but this time I refused the lock box and instead nurtured my wounded heart in the sunshine and fresh air. I found that the love it was already made of was more than enough to keep growing. The moral of the story: You are love. You don’t get love from someone else. You can lose the chance to share love with someone else, but you don’t have to lose your own. Your most important relationship is with yourself. Love yourself first and always and you will have more to give; bigger, better, wiser and more beautifully vulnerable than ever. Love yourself. You are more than enough.